The Bamboo classic candle by NEST Fragrances includes notes of flowering bamboo mingled with a variety of white florals, sparkling citrus, and fresh green accords. The NEST Fragrances everyday collection combines color, texture and fragrance to enhance the everyday living and entertaining experience. The glass vases are designed to compliment the beauty of its surroundings; the classic shape and modern stripe etching will complement any décor. Each of the fragrances has been created by the most accomplished perfumers at the world's leading fragrance houses. 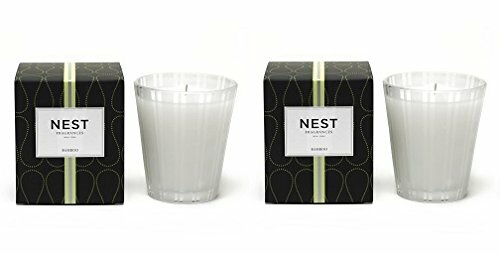 NEST Fragrances Bamboo Classic Candle consists of flowering bamboo mingled with a variety of white florals, sparkling citrus and fresh green accords. If you have any questions about this product by NEST Fragrances, contact us by completing and submitting the form below. If you are looking for a specif part number, please include it with your message.